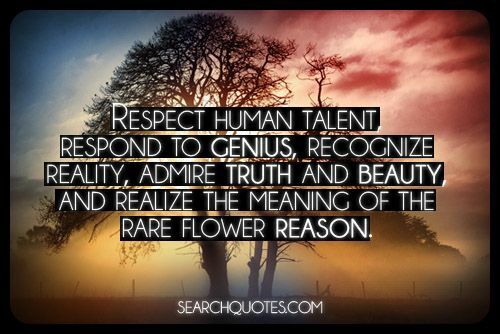 Respect human talent, respond to genius, recognize reality, admire truth and beauty, and realize the meaning of the rare flower reason. If you are willing to respect the talents of others, the genius of others, and genuinely love the beauty of someone being able to be honest with how beautiful they really are inside, then you will actually be able to see more of the beautiful parts of life. It is hard to understand why some people are able to love others. But those who are full of peace on the inside are much better able to appreciate the little things in life, including the love of everyone around us. It is hard to love everything in our life at every single moment, partly because it is really hard to focus on things that we are used to seeing and experiencing on an every day basis. The fact remains; we must learn to appreciate the things that help make this world different, and the things that help us to grow. Love the world, show support to artists, and high achievers, live inspired.